There’s a lot of information and opinions floating around! 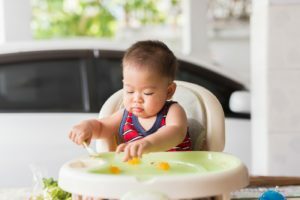 Many professionals recommend using sippy cups in moderation, if at all, because of the way they can affect children’s teeth, swallowing patterns, and speech development. While sippy cups help keep the house clean by preventing spills, using them often might not be beneficial. Drinking the milk or juice that’s inside it all day might not be good for your little one. Juice has a lot of sugar. If kids drink milk or juice from their sippy cup throughout the day, the sugar found in those two drinks stays on their teeth longer and could cause cavities or tooth decay. Also, some speech-language pathologists discourage drinking from sippy cups because of the way children must use their tongue and mouth. Have you noticed how when you take a drink from an open cup, your tongue is pushed up against your alveolar ridge (the bumpy part of the roof of your mouth behind your top teeth) before the liquid is pushed back to swallow? When a child drinks from a sippy cup, they can’t lift their tongue up. This makes drinking from a sippy cup similar to drinking from a bottle and therefore limits a child’s ability to develop a more mature swallow. Having kids drink from a cup with a straw or an open cup are great alternatives to the sippy cup! Try introducing these types of cups when kids are ready to transition away from the bottle. Children can typically learn to drink from a straw by 9 months and from an open cup, when held by an adult, at 12 months. Parents will be surprised to find that most kids are able to drink from straws or open cups with a little bit of help from caregivers. If you choose to use a sippy cup, use it in moderation and watch how quickly your child takes to drinking from other types of cups! There are great no-spill straw cups if your concern is to decrease the mess. Limiting the number of times kids use sippy cups each day. If they drink out of it at breakfast, lunch, and dinner, start by removing the sippy cup at lunch time and replacing it with a regular cup. Then, transition to using regular cups during breakfast and dinner. Put a thick liquid in a smaller cup for practice—this could be a shake or yogurt drink, some watered down applesauce, or a smoothie. When learning how to use a cup, your little one can practice with a child sized glass. If you’re looking to make the activity even more fun, try giving them a bit of thick liquid in a tiny medicine cup. Purchase “big kid” open cups with their favorite characters, animals, or colors on them. Having your child donate their sippy cups themselves (with your help, of course). Explain that big boys/big girls do not need sippy cups, but other younger kids can use them! It can take 6 months to learn how to use an open cup without spilling. Remember when transitioning your little one, it may be best to have them practice using an open cup in spaces where they can spill. In no time, they will be fully transitioned and ready to drink from a big kid cup like mom and dad! What more info on children’s development? Go ahead, play with your food! You’re also playing with your senses! Help your child prepare for the newest member of the family! Previous Previous post: What is a Pediatric Occupational Therapist? Next Next post: When Will My Baby Smile?